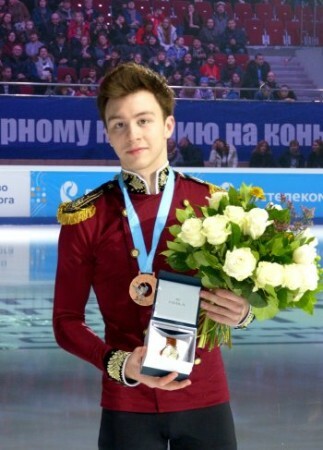 Dmitri Aliev (18) won the bronze medal at the Russian National Championships and has been selected to compete at the European Figure Skating Championships in Moscow. Q: How do you analyze these Russian Nationals for you? A: First of all, this championship was one of the hardest competitions for me, I would even say that it was the hardest competition of my whole career. It was the qualification for Europeans and I realized that I have all chances and that I had to pull myself together morally and get ready physically. Unfortunately, analyzing my performances I can say that I am satisfied with the short program, it was a good skate, but I was not well enough prepared psychologically for the long program. It is tough when you know you have the chance to get to go to Europeans, you need to make the National team, then there will be the qualification for the Olympic Games and it is a very important season. With all my injuries I knew that it would be hard for me. But I was able to use this chance and to qualify for Europeans. Then, closer to the Olympics it will be clear what and how. Q: How much easier will it be to compete at the European Championships? A: I don’t think that it will be easier. In fact, each competition is such a riddle, anything could happen. You can be in good shape physically, but not be ready psychologically and it can be the opposite – you are well prepared psychologically but you are in bad shape physically. Therefore, you need to find that line to start from and you need to fight always the same way at competitions, sharply, consistently and well. Q: You looked very good at the test skates, but then you got injured and you saw how Mikhail Kolyada and Sergei Voronov made the Grand Prix Final and Alexander Samarin did well, too. Did you have doubts that you can make it at Russian Nationals? A: It has been a difficult time for me and we did not know what kind of decision to take concerning my injury. It was either being in a cast for a month to heal the foot, but then, unfortunately, you get out of shape and need to get back into shape. We decided to skate. Each person probably has some pain and one day he wakes up and nothing hurts. I had these moments when my foot was better, then I trained harder. We looked for the right approach and the right way to prepare, because I wanted to compete at the senior Grand Prix. I might not have skated the best, but I got a lot of experience and I enjoyed skating in Japan. When I travel there, I enjoy what is going on, in the competition and also off the ice. But the injury, unfortunately … I saw how the others started the season, how they got better and better and I realized that Misha (Kolyada) and Seriozha (Voronov) are already at the Grand Prix Final, they are old hands and I’m just like a grey dot. But I understand that I can shine as well, that I have difficult elements and if I am doing them clean then I can compete with these guys. Q: Please remind us what exactly your injury was or is. A: It is still bothering me, but in these three months I grew used to the pain, so I am working through the pain and I don’t even notice it in practice anymore. It is my right ankle, therefore we took out the quad Lutz, because I couldn’t do it unfortunately, it is too painful. But I am like that – I still want to do it. We are doing different therapies, treat, rehabilitate, but at the same time the work, the practices are continuing, so that there is constantly strain on the foot. It cuts both ends, in the end it is somewhere in the middle, because it still didn’t go away. The inflammation is not going away, but I hope that somehow it will go away eventually. Q: This season you made your programs significantly harder. When did you decide about that? A: We took this decision already when I at the end of last season started to land the quad Lutz consistently. I also did the quad Salchow. Now I don’t do it (the Salchow) unfortunately, because it changes the content and for now we think about how to make the programs consistent. At the summer training camp in Latvia we included four quads in the free program and two quads in the short. In fact, if I was now in the shape that I was in at the training camp, I would be very happy and I would see good scores and results. Q: What do you think your chances are at the European Championships? A: To be honest, at this moment I don’t want to think about any chances, because I am in a very positive, festive mood before the New Year like probably everyone and I want to end this year, leave my injury in the old year and start the new year preparing for the European Championship with fresh energy, with upswing and courage. Q: Right now you are the top skater in your group. How do you deal with that extra responsibility? A: (sighs) Now I will answer quite openly … There was a time when Kostia Menshov and Vladik Sezganov were skating in the group, but then these guys wrapped up their careers. I realized that we have a big group, but that there are less kids that I can try to keep up with at least in practice. In skating worldwide, the situation is different obviously. At first it was tough, I even spoke about that with a psychologist, but luckily, the psychologist said: “You don’t have any problems, you just go out and enjoy the process of working.” Now I don’t pay attention to the fact that I am the top skater in the group. We have a strong, big group that loves to work. You know, I won’t speak for them, but just for myself. I don’t have great results in this season. Yes, unfortunately, there is the injury, but I don’t want to blame everything on that. I think that me and the other guys have their job to do. And the coach, Evgeni Vladimirovitch (Rukavitsin) is handling us. 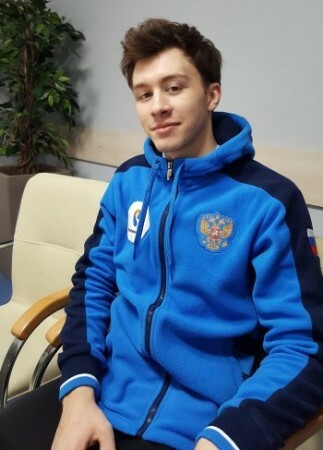 Q: Mikhail Kolyada also is skating in the Figure Skating Academy. Maybe you are sometimes training together and how does that help you? A: You know, those were interesting practices when Misha and I were able to compete with other doing jumps in a playful way. For example, that quad Lutz, we had two tries and we checked who is doing and who is not doing two out of two. Misha and I get along very well off the ice, we are friends, we are supporting each other, asking each other how things are going. These practices are also interesting, because it is the thrill of competition, there is an extra push, because it is like a mini competition. That used to happen more often, but now, as Misha was at the Grand Prix Final and prepared for competitions and I prepared for other competitions and I had the injury, we didn’t have these practices. I think it is for me and Misha interesting to be on the ice together, to feel everything and it is also a kind of atmosphere for the coaches. Q: Who is the leader and the soul of your group? A: (laughs) I think that’s me. Obviously, this in our circle, because we have been skating together in one group for quite long, we all know each other and we have our special jokes. That means, if I make now a joke, you would not understand it. We really have a very good, friendly collective, I think I have been dreaming about such a collective and about training in such a good group. Q: How would you react if another male skater of your level joined the group? A: That would be interesting, that’s also competition. But I can say that Anton Shulepov as well as Makar Ignatov also do quite difficult elements in practice that sometimes I have to gnaw my elbows. Q: How does your coach usually fire you up or calm you down when you get nervous? A: In fact, that is always different. As I already said, each competition is a riddle and anything can go wrong. So for example we got into a fight with him before the short program. We were there, where they take the interviews, where the cameras are behind the Kiss & Cry. He took me there and decided he needs to put me into a flutter and started attacking me. It was a kind of mini fight to work me up, drive me mad so that my body would be like a clenched fist, hard like a stone. Q: What role does Olga Glinka play? A: Our whole coaching staff is like my second family and it has been a while like that. We went through a lot together, they are always on my side, when there are injuries, when there are highs and lows. They know me like a son probably and I relate to them as my second parents. Unfortunately, I don’t get to see my parents, but Olga Germanovna (Glinka) as well as Evgeni Vladimirovitch (Rukavitsin) and Valentin Nikolaevitch (Molotov) are taking the role of my family, that is everybody is giving me something new. Olga Germanovna is a very warm person, she finds the right approach and she knows what to do when someone wasn’t well to make him feel better and also when it is better to leave him alone. Q: What is the best way for you to relax? A: That is always different, but, probably when you realize inside that you are feeling comfortable, good. That is not just lying around at home. I love active rest. When I am at home in Ukhta, then I am skiing, I was a skier after all, or I’m riding the snowmobile. That nature and that scent … For me the best way to relax is when I feel good inside.